Sympathetic Nerve Block, good solution? Jun 27 Comments Off on Sympathetic Nerve Block, good solution? A sympathetic nerve block is firmly believed upon by many pain health specialists to be an efficient method for controlling chronic pain. However, there is not a great deal of medical evidence to show whether these blocks are actually helpful. This therapy targets the sympathetic nervous system. The sympathetic nerves are a group of nerves that are found along the front side of the spinal column that help control several involuntary functions of the body. The involuntary actions are referred as the actions you have no control over. These include blood flow, digestion, and sweating. A sympathetic nerve block is an injection that can be used to treat pain which is a consequence of Complex Regional Pain Syndrome (CPRS), Raynaud’s syndrome, and some types of abdominal pain. This injection involves injecting local anesthetic in the area where several nerves meet. The target is to reduce or abolish the pain signals being sent to the brain. The location of your pain typically determines where you’ll receive the nerve block. Your sympathetic nerves come together outside your spine area in thick networks of nerves called ganglions. If you have pain in the upper part of your body, you may get pain relief from blocking the stellate ganglion in your neck area. If you have pain in the lower part of your body, a ganglion near the lower spine may be targeted with a lumbar sympathetic block. An experienced pain physician will locate the exact position of the target nerves using x-ray or fluoroscopic guidance to guarantee procedure’s truthfulness. Once the exact area of nerve pain has been located, the physician will inject an anesthetic solution. The procedure typically takes less than 30 minutes and patients are able to leave shortly after their procedure is complete. High blood pressure or if you are on blood thinners. If you have consumed solid food or fluids after midnight a day before the procedure is to be held. A sympathetic nerve block is a relatively safe procedure. You can usually go home afterwards and return to your normal activities after a day of rest. If you had IV sedation, you’ll probably need to have someone drive you home. Sympathetic blocks don’t work for everyone. Also, the pain relief they give may lessen over time. 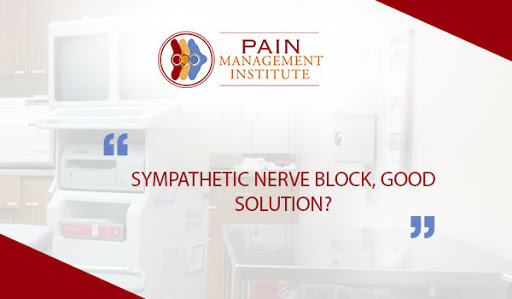 But for some, a sympathetic block may provide weeks or months of pain relief.